110mm diameter. 22mm bore size. Use for prolonged cutting of all types of tile. ..
180mm diameter. 22mm bore size. Use for prolonged cutting of all types of tile. 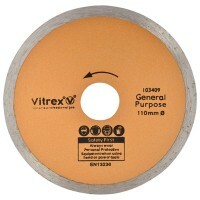 ..
Vitrex 103409 General Purpose Tile Cutting Diamond Blade Features Diamond blade 110mm. ..
Vitrex 103412 Ultimate Tile Cutting Diamond Blade Features Diamond blade 200mm. Com..
115mm diameter. 22mm bore size. 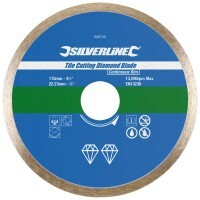 Use for prolonged cutting of all types of tile. ..
150mm diameter. 22mm bore size. 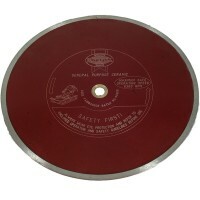 Use for prolonged cutting of all types of tile. 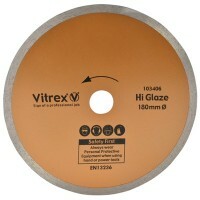 ..
Vitrex 103406 Hi Glaze Tile Cutting Diamond Blade Features Diamond blade 180mm. 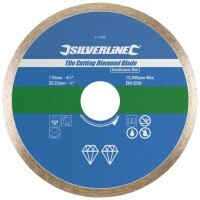 Com..
Faithfull FAIDB180CR Tile Cutting Diamond Blade Continuous Rim Features Diameter: 180mm. ..
Faithfull FAIDB105CR Tile Cutting Diamond Blade Continuous Rim Features Diameter: 105mm. 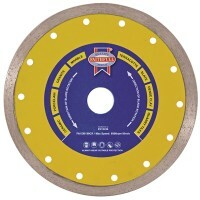 ..
Faithfull FAIDB300CR Tile Cutting Diamond Blade Continuous Rim Features Diameter: 300mm. 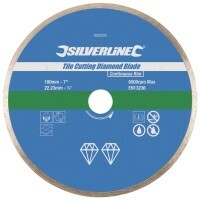 ..
Faithfull FAIDB105CR Tile Cutting Diamond Blade Continuous Rim Features Diameter: 115mm. ..